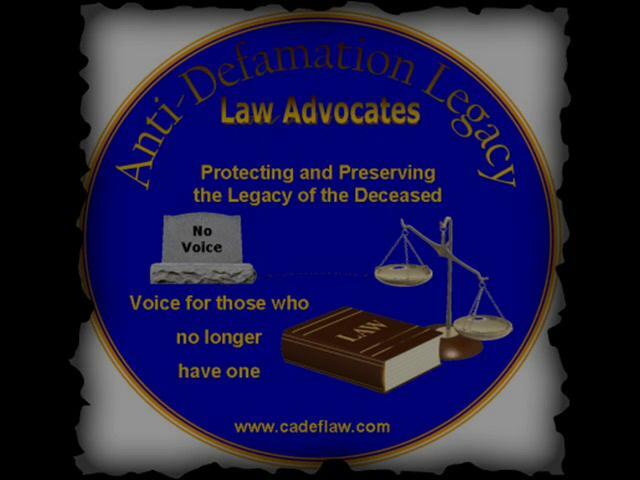 Protect and Preserve the “Legacy” of the Deceased. Those Left Behind Can Be Hurt. After spending years studying defamation laws and the many locations which provide instruction on how to slander without being exposed; we are at a new place. A solution is being proposed which will insure would-be slanderers no longer need to rely on dissimilation if discovered. This solution would completely relieve the slanderer of responsibility and the consequences of their actions. Advocates against slander express concern over rumblings from sectors of the Media proposing slander laws should be eliminated. These sectors are using the deaths in Paris to establish arguments for discarding these laws. Why anyone would think having or not having slander laws would have prevented the Paris tragedy is beyond me? The only thing I can see this would accomplish is to inflame people, perhaps move them to extreme action when they might otherwise have taken their grievances to court. That is why there are laws, measures meant to prevent people from taking the law into their own hands. Persons who slander and avow an affiliation with a religion which teaches from the Bible seem to have forgotten there is another set of laws. The ones handed down by God. I have found the Ten Commandments have a prevailing principle. Thou shall not steal. Do not steal what belongs to God. Do not steal from your parents and neighbors what is theirs. The Ninth Commandment is most specific: Thou shall not bear false witness against thy neighbor. When you slander someone with intent you steal what is theirs; that theft is no lesser than if you broke in their home and took what does not belong to you. Slander for gain is the same as if you took that stolen possession and sold it for your profit. All the rhetoric in the world and titles; teacher; doctor; barber or journalist changes nothing, when you slander no matter living or dead you bear false witness. If we would remember and abide by that Commandment there would be no need for slander laws. However, until that day there is a need, if anything it grows greater as our Social Media and lack of control on it increases. Until our information providers cease tilting the balanced credible in favor of the unethical and unreliable. Slander like every other crime creates more than one victim and affects more than the intended target. But unlike a theft where the property is recovered once slander is done, the target and those affected can never completely recover what was taken. The comments and opinion expressed here are solely the writer’s and do not reflect the opinion of all the Members & Supporters of AdLLaw. SEE "Donate to Cadeflaw Projects" tab on WordPress site at top of page.